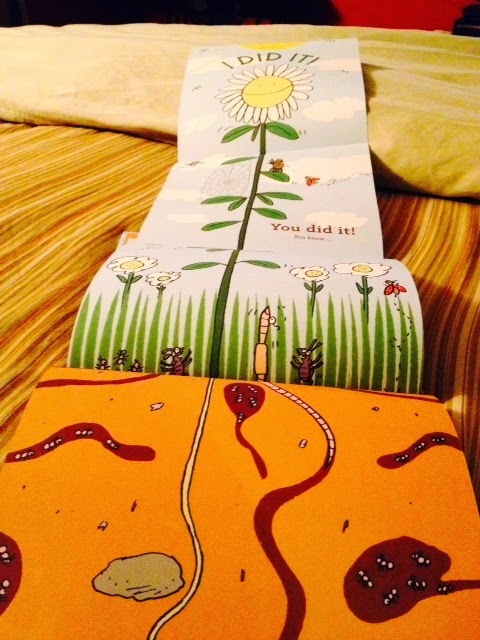 Shows plants, critters, stages of life and/or life cycles. Shows above ground and underground. I want to introduce layers or levels to my kiddos. I'm hoping to create a collaborative mosaic that shows what's happening underground, above ground (in the garden/fields as well as in the city/country) and in the sky. Meh :/ - kind of cheesy; has a positive message, all the insects are cheering for the seed to grow. The seed seems kind of whiny and intimidated; he is scared of the dark, of the light, of monsters that may be under the bed(? ), of monsters that may be over his head, above ground. In a couple of sections, the pages open up and fold out in different directions. There are plenty of bugs and creatures to spot both above ground and underground. One page vilifies a spider that's minding her own business underground. Some of the pages fold out in different directions. This book did show layers... I liked the way that the ground and above ground were presented in layers and levels. This style of illustration is similar to the look that I'd like the mosaic to have, so it may be a good book for discussing the illustrations. But, I don't think I'll be reading the book to the kiddos. My impression: During my first thumb through, I wasn't too impressed with this book. However, when I looked through it again, I started to notice a few different things that could spark discussions. This book could be a good discussion starter for seed saving and where plants come from, as well as different landscapes/ecosystems/environments. and favorite line, "Take care, my little ones, for the world is big and you are small." 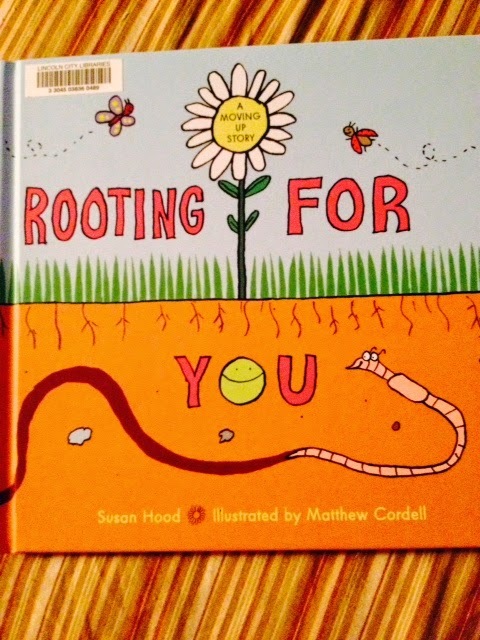 This book did show many different landscapes and environments for different seeds to grow... For example, Miss Maple takes the seeds on a field trip to a river where frogs on a log, dragonflies, tadpoles and water lilies live. It's a fun introduction to what seeds are and how they might disperse, but leaves a lot of room for discussion. While not specific to actual gardening, the main character's imagination creates her own whimsical garden with chocolate rabbits and jellybean bushes. I like the idea of introducing this book to get the kiddos thinking about abstracting their garden mosaic designs to incorporate things that might not grow in a garden, as well as coloring flowers or things non-traditionally to free them up to the idea of creating in glass. For instance, we may not have access to as much yellow glass as they'd need to make a sunflower, so they could create a pink or purple or white one instead. This book did have really good illustrations... that could be interpreted into mosaics easily. While I don't want to have the kiddos copy the illustrations, they could observe them to talk about the criteria and qualities that make a good mosaic / image. I like how the illustrations present subjects in untraditionalcolors or styles. "When the Root Children Wake Up"
Absolutely GORGEOUS paintings! I adore the style and the story in this book. The paintings that make up the illustrations are breathtaking! This book did not quite fit my criteria for the mosaic project I have in mind. Although, it would make for a good introduction to the changing of the seasons and I'm sure we could have a good discussion surrounding the story and perhaps work on a supporting project that got the kiddos thinking about subjects they may want to incorporate into their mosaic. A look inside: classifying vegetables by anatomy, producing vegetables in a garden. 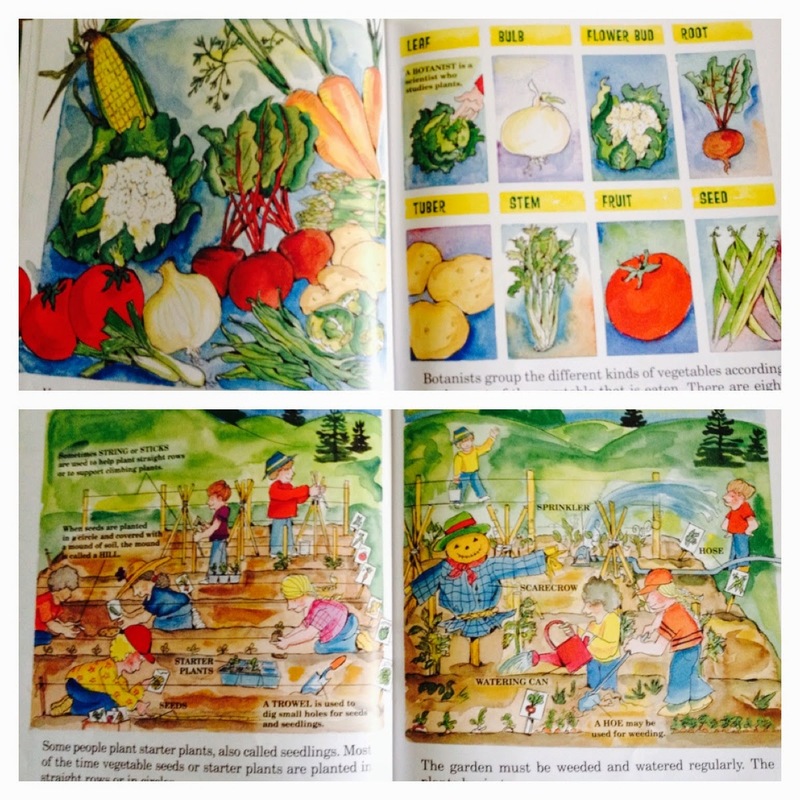 The illustrations will be helpful references for looking at different vegetables and drawing them. I think I'd like to add it to my personal library. Food production, from farm to store. This book did... explain a lot of vocabulary, showed a process, categorized vegetables by anatomy. Do you have any good children's book recommendations?